China is all about numbers. 8,000 life-sized Terra Cotta Warriors. 3,750 miles of the Great Wall of China. 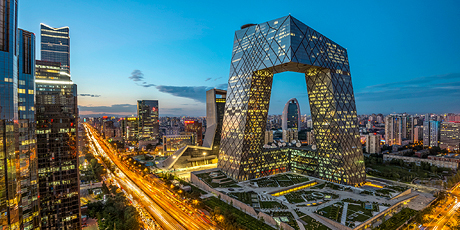 21 million people in the country’s massive capital, Beijing – a truly 21st century city. A nation with 5,000 years of history still tops lists as one of the most attractive travel destinations in the world. 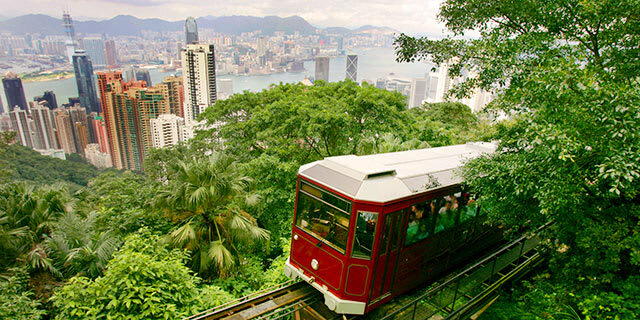 From the rice paddies-turned-modern metropolises, Hong Kong’s neon skyline and Macau’s glitzy Las Vegas vibe to the holy temples of Beijing and beyond, China holds surprises at every turn. Across this vast country ancient traditions and superstitions blur together with today’s business, travel, and cultural establishments. 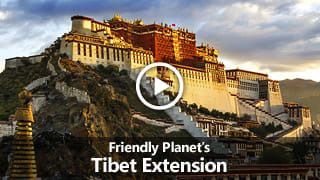 And these closely held traditions shine when you leave the city and venture into vast, rural China where remote villages and ancient temples are scattered throughout the country’s 3.7 million square miles. With a population of over 21 million people, China’s capital city of Beijing is a force to be reckoned with. Beijing is located at the northern tip of the triangular-like North China Plain and is surrounded by mountains from the north, northwest, and west, which shield the city quite well. Becoming more urbanized each day, Beijing is modernizing while still maintaining its ancient, old-world charms. That’s what’s so exciting about this incredible city- new technologies and structures can be seen at one moment, and at the very next you can see an ancient temple, wander the narrow hutangs (alleys), and chow down traditional Mongolian lamb and Sichuan-style crayfish! The Great Wall of China is as impressive as it is long, spanning over 3,750 miles. The wall stretches east from Dandong to the west of Lo Lake. Before the Ming Dynasty when bricks were used to add to the wall, rammed earth, stones, and wood created its foundations. 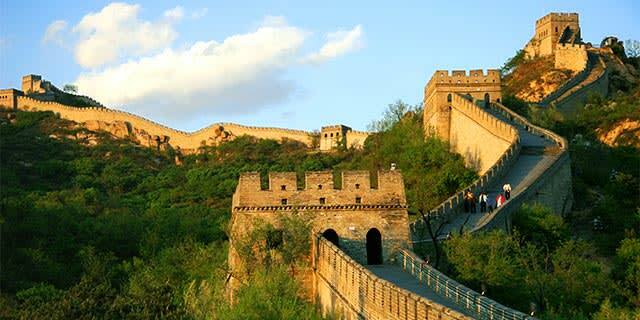 Fully created by the Ming Dynasty, the original goal of the wall was to protect the old northern borders of China from various nomadic groups of the Eurasian Steppe. 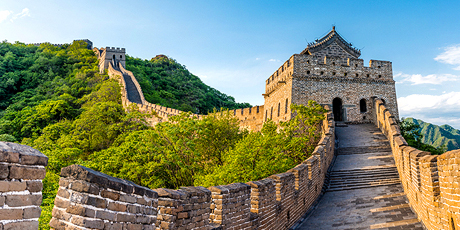 Several walls were built during the 7th Century B.C.E., and eventually, these fragments were joined together to create a stronger, more fortified structure, that today is referred to as the “Great Wall of China” that so many flock to see! 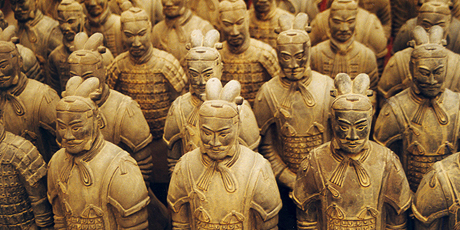 The Xi’an & and the Terra Cotta Army are clay sculptures depicting the armies of Qin Shi Huang, the first emperor of China. These sculptures exemplify a form of “funerary art,” representing the life of the late emperor. They were buried with the emperor in order to protect his spirit in the afterlife. Created around the late 3rd Century B.C.E., these figures were discovered by local farmers in Lintong District in 1974. Each soldier sculpture may be a part of a different rank in the army, resulting in various sized likenesses. The tallest are the generals, and other possible ranks are warriors, chariots, and horses. 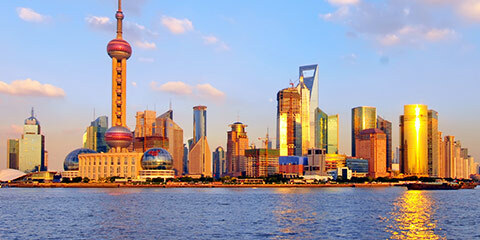 Steeped in a curious history full of gangsters and colonial adventurers, Shanghai has blossomed into an incredible hot spot that is a must-see for travelers to China. As the most populous city in the world it stands at a striking 24 million in population—and is on the rise. Glass-and-steel high-rises have created a stunning skyline among the clouds as down below, commerce and culture flourish. Don’t miss a chance to check out the city’s budding arts scene, including music and Chinese Opera, as well as traditional Chinese cuisine. The Yangtze River is not only the longest river in Asia, it is the third largest in the world, behind the Amazon and Nile, respectively. For 3,915 miles, it wanders throughout China’s borders – creating a scenic water way and contributing immensely to China’s economic boom. In fact, the Yangtze River Delta generates around 20% of China’s gross domestic product. The Three Gorges Dam which crosses the river near Sandouping in the Hubei province is the largest power station (hydroelectric) in terms of installed capacity. 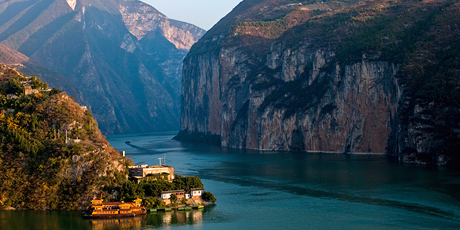 Those who have the pleasure of cruising the Yangtze River will be treated to incredible views of The Three Gorges (Qutang, Wu and Xiling) which lie between Chongqing and Yueyang and features cliffs that soar thousands of feet above the river. The Forbidden City served as the Imperial Palace of China for almost 500 years, spanning from the beginning of the Ming Dynasty (1368–1644) until the end of the Qing Dynasty (1644 – 1911). As the political center and stronghold of China, many emperors and their families lived within its fortified walls. Recorded as the largest collection of reserved wood from the ancient world, this structure is now the residing place for the Palace Museum. The Forbidden City is a rectangular edifice that is located in the center of current day Beijing. 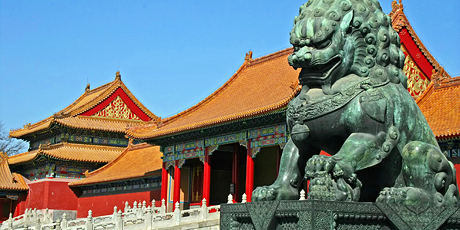 The design of the Forbidden City reflects a significant amount of symbolism. For example, yellow symbolizes the imperial power of the emperor, so all of the roofs are glazed yellow. 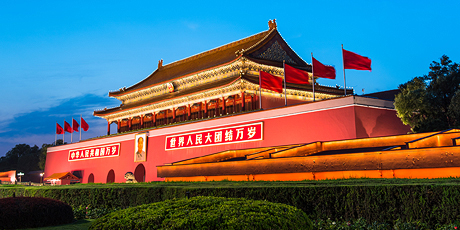 Beijing’s city square, better known as Tiananmen Square, is one of the city’s most iconic sights. Tiananmen translates to “Gates of the Heavenly Peace” and is named for a monument placed there to mark the entrance into the Imperial City (where the Forbidden City was located). In 1989 the infamous Tiananmen Square Massacre occurred -- a clash between authorities and college students who were advocating for democracy. This remains one of the most politically-heated topics in China, just as Tiananmen Square remains one of the most visited places by travelers to the city. 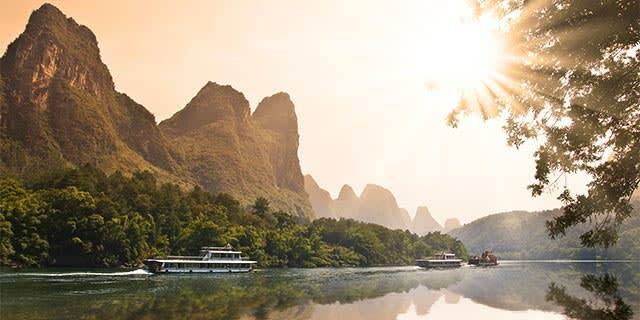 Already booked on one of our packages to China? See everything you need to know before you go. U.S. citizens must have a passport which is valid for at least eight months after your return date, though we recommend at least a year. U.S. passport holders must have a visa to enter China, obtained prior to arrival. Applications must be submitted in person by the applicant at the China Embassies or Consulates in the United States or through a fee based visa service such as our preferred provider, Visa HQ. See the U.S. Dept. of State website for more information. We will send a visa support letter and instructions for U.S. passport holders to obtain your visa through VISA HQ after you have completed your registration form and made your final payment, approximately 60 days prior to departure. Please apply for your visa only after receiving this letter. Booked on one of our packages with Scheduled Dates? We will send a visa support letter and instructions for U.S. passport holders to obtain your visa through VISA HQ after you have completed your registration form and made your final payment, approximately 60 days prior to departure. Please apply for your visa only after receiving this letter. According to the Center for Disease Control, there are no requirements for travel to China, but immunization against polio, tetanus, typhoid and hepatitis are recommended. Also ask your doctor about malaria suppressants if you will be visiting Hainan Island and areas close to the Laotian and Myanmar borders. Be sure to take insect repellent! Northern China is best seen in September and October, and southern China is best seen in November and December. Winters range from extremely cold in the north to moderate in the south. A small gratuity to your guides and drivers in China will be greatly appreciated by them. It is customary to collect group tips and distribute them among the guides in each city by your China National Guide. The recommended amount for your China National guide is $6-$8 per person per day, $4-5 per person, per day for the local guide, and $2-3 per person per day for the driver. It is also customary to tip the hotel staff. Our recommended amount is $1 per person per day for housekeeping. The same amount is recommended for restaurant staff. As always, gratuities are an individual expression of thanks and should be based on the level of service provided. ATMs are not always hooked up to international banking networks. Machines accepting foreign ATM cards have CIRRUS or MAESTRO logos. It is preferable to take along cash, travelers checks or credit cards. The best shopping is often at public markets. Shop for carpets, chops (ink seals), stone and jade carvings, wood-block prints, cloisonne, patent medicines, embroidered linens, reproductions of old art, glass items, silk, hand-painted snuff bottles, musical instruments, and ethnic tribal crafts. 220 volts. Plugs A, I & G. You will need a voltage converter and plug adapter in order to use U.S. appliances. We recommend getting a universal adapter and converter kit before your tour to China. View more information about electrical standards around the world. Beijing time is a thing! No matter where you are at in China (and despite its massive size of more than 3.7 million square miles!) everyone is in the same time zone. There are more than 40,000 characters in the Chinese written language. Each character (or series of characters together) express meanings or things and most people only know a few thousand characters. Visiting Buddhists (or those passionate about Buddhism) can visit famous shrines in the four sacred mountains: Emei Mountain (Sichuan), Wutai Mountain (Shanxi Province), Jiuhua Mountain (Anhui) and Putuo Mountain (Zhejiang). The birthplace of kung fu is the Shaolin Temple in Zhengshou (south of Beijing). Check out our blog for our latest articles on China.